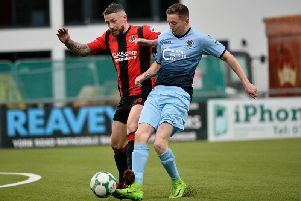 Institute's new signing Saul Deeney could make his debut against Dungannon Swifts, on Friday. Institute manager Paul Kee may give a debut to new signing Saul Deeney, in their massive encounter with Dungannon Swifts; on Friday evening (KO 7.45pm). The 31-year-old goalkeeper, who has signed until the end of the season, returns home today (Wednesday) after spending over a decade in England and Kee admits he may throw the ex-Derby County man in at the deep end. Stute were in talks to sign Deeney in August after Michael Doherty moved to Coleraine, but things didn’t work then, however Kee has got his man now. “Hopefully if all the paper work and he comes through a training session then he might be involved, but we’ll wait and see,” stated Kee. Deeney came to the fore way back in 2006 when in the FAI Cup for non-league Burton Albion he kept a clean-sheet against a mighty Manchester United side which had the likes of Gerard Piqué Wayne Rooney and the recently crowned Ballon d’Or winner Cristiano Ronaldo all playing. Since then he has moved on Notts County, Hucknall Town back to Albion, before signing for Derby County, following ex-Burton boss Nigel Clough to Pride Park. Unfortunately after Clough was replaced by former England boss Steve McClaren, Deeney dropped down the pecking order and was eventually released in January 2014. He has been living and working in Nottingham along with playing with a junior side. “Since he has left Derby he has been playing with Basford United, who play in the Midland Premier League in Nottingham, but he has decided that after spending the last 15 years in England that he wants to come home. Kee also confirmed that striker Davitt Walsh has also re-joined the club after he returned from New Zealand and another striker could be in later this week. The Drumahoe man also confirmed that Ryan Varma and Gary Henderson have left the club, while striker Paul McVeigh is also possibly looking at his situation at the club. Meanwhile there will be live commentary of the game on Radio Foyle starting from 7.30pm. With Eric White joined by ex-Derry City and Crusaders captain Eamon Doherty in the commentary box.